FEARS are growing that Hurricane Irma could destroy America’s eastern seaboard as it threatens to become the world’s most powerful storm with winds of more than 200mph. Some experts warn Irma’s characteristics mirror those of 1960’s Hurricane Donna which left a death toll of almost 400 and destroyed tens of thousands of homes as it swept along the Atlantic coast from the southern tip of Florida to New England in the north. And as Hurricane Irma threatens to bring devastation to huge swathes of the US East Coast, it’s feared Irma could be even worse than Donna. Deadly Donna was only a Category 4 storm with maximum wind speeds of around 160mph whereas Irma has already a potentially catastrophic Category 5 hurricane packing sustained winds of 185mph and more. A number of models put Irma on track to hit Florida before moving north into Georgia. But other projections put Hurricane Irma making landfall around North and South Carolina before heading north to hit New York City. And some forecasters are warning everyone living along the coast to start preparing for its arrival. Hurricane Irma’s power is now so immense it has now started to register on equipment designed to measure earthquakes. Donna was the most powerful hurricane of the 1960 Atlantic storm season and struck at exactly the same time of year as Irma. It is still the only hurricane on record to produce hurricane-force winds in Florida, the Mid-Atlantic State and New England. If Irma does follow a similar path to Donna 57 years ago, the impact will be catastrophic. Bridges were washed away and wooden homes reduced to matchsticks for miles when Donna stuck. The trail of devastation stretched from the Florida Keys to New England. Wind gusts of 130mph were recorded in Rhode Island and a terrifyingly large 100-mile-wide-eye later crossed Long Island. 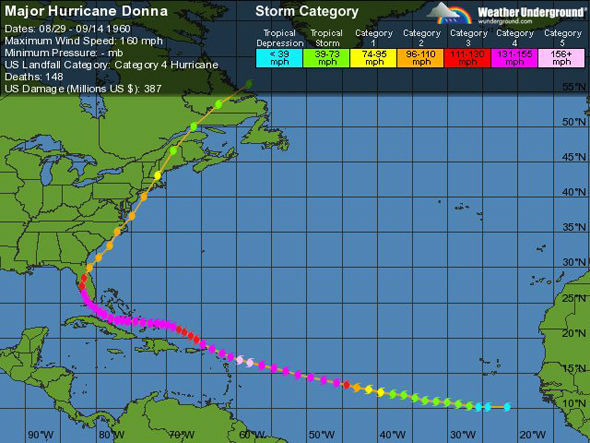 Hurricane Donna remains the fifth strongest hurricane to hit the US and affected more than 50 million people. Irma is already the strongest hurricane ever recorded outside the Caribbean and the Gulf of Mexico and is now forecast to make landfall somewhere in Florida over the weekend. Hurricane Irma comes hot on the heels of Hurricane Harvey, which caused devastation and flooding in the states of Texas and Louisiana and left at least 66 people dead. There was another Hurricane that was bad for Fla and hat one Hurricane ANDREW it caused alot of damage people so would heed any thing that the weather people tell you do . If you don’t have raincoats —use a heavy garbage bag with for a raincoat. —Don’t want hypothermia. Have backpacks for all family members filled with what they need. Even the baby. Have water in the car and blankets even if you have to sleep in he car. It can be done —think it out now rather in a crisis. Make a list and have everone pitch in to be ready.. Eat a good supper now.